YouTube is about to change how they’ll be showing video ads to audiences. The company recently announced that YouTube will begin a new testing process that places two video advertisements back-to-back before the start of a video. Both advertisements will be skippable so audiences won’t be forced to sit through their entirety. The company says that whenever this “ad pod” appears, it reduces the odds of another ad interrupting a user’s chosen video later on. YouTube stated that they will be testing these “ad pods” because viewers are “sensitive” to how frequently they are shown ads – especially when in the midst of viewing a longer video. When there are less interruptions, the abandonment rate is reduced and there is a higher rate of the ad being viewed. These pods will initially launch on desktop and will shortly be available on television and mobile. YouTube currently offers the three different video ad formats listed below. Instream Ads: These are the ads most viewers are familiar with and which will likely be part of the ad pods. Appearing before, during or after a video, viewers can skip the ad after five seconds of viewing. Bumper Ads: Being six seconds or less in duration, users can’t skip this type of ad. These ads tend to work best to enhance brand awareness and reach. Video Discovery Ads: Appearing alongside related YouTube search results and on the homepage, this ad format works well if you want to target audiences with specific keywords. The type of video ad format you choose for your pool and spa company will depend on the goal you’re trying to achieve. Instream ads can be extremely effective if you have some stellar pool or spa info to share over the course of 30 seconds and are able to make that known in those first five seconds of the video. 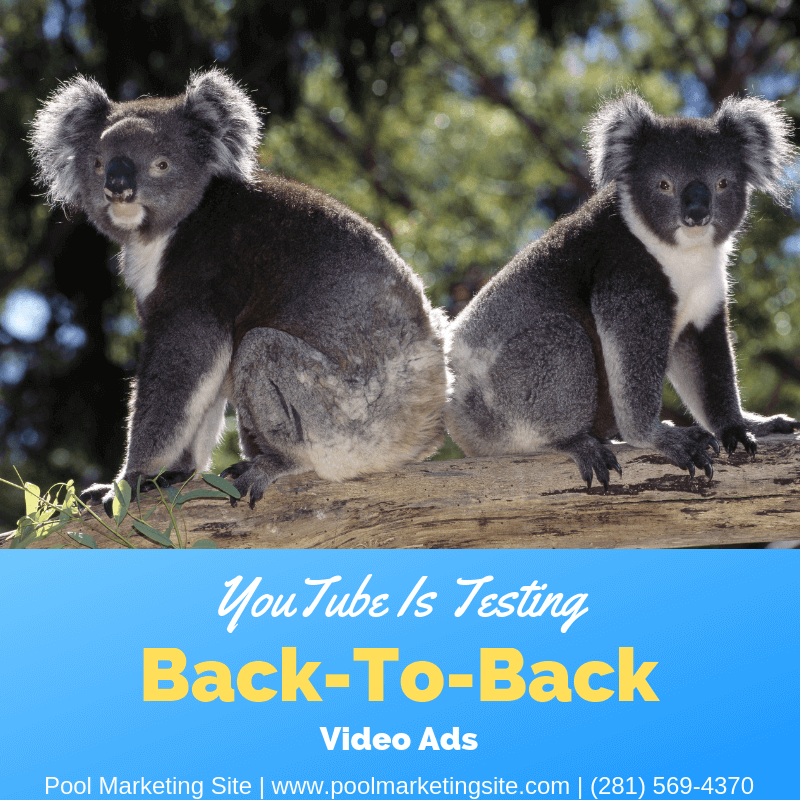 Bumper ads are great for getting the word out about your pool and spa company before a related product video rolls. Discovery ads are great for advertising brands and products, and businesses are only charged when viewers click on your ad’s thumbnail. Want to Learn More About Advertising with Video Ads? Send a quick email to the Pool Marketing Site digital media marketing team at info@smallscreenproducer or call us today at (281) 569-4370.